The Russian North has always held an attraction for those who harbor a desire to get away from it all, and discover the Real Russia. This was not the first time I had travelled within a few hundred kilometers of the Arctic Circle. Twenty two years ago I hitchhiked, illegally at the time, to the Solovetsky Islands whose terrible 20th century history and religious resilience encouraged me to make a pilgrimage there; sleeping in trains, railway stations, even barges on the way. 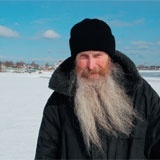 This time, on my second journey to the Russian north, my status was different – I was now a tourist, and glad to be able to sleep in proper beds. My destination was some 400 kilometers to the south east of those islands, to a little-known area in the southwest of the Arkhangelsk region, to a place little known to the outside world: Kargopolye. This is an area of 10,000 square kilometers surrounding the small town of Kargopol, not far from Lake Lacha, where the Onega River commences its 420-kilometer journey to the sea. Kargopol, which has a population of only 10,000, is reached by overnight train from Moscow to Nyandoma, which means ‘rich land’ in Finnish-Gorsky, then a 90-kilometer drive west to Kargopol. AST travel organised my trip and provided my guide; Radik Adnobaev, who met me in Nyandoma. Although already well into April, snow was piled up over a meter high along the sides of the road. After a heavy overnight snowfall on the night before our journey, even the rugged, yet bumpy road handling abilities of Radik’s new Patriot (UAZ) vehicle were tested. Unlike the Moscow region, there were no habitations every few kilometers, just endless flat-lying forests stretching from the side of the road to the horizon. Radik, who like all good guides was extremely informative without seeming to try, explained that many of the older, smaller villages were abandoned after the collapse of Soviet agriculture. For locals in Kargopolye, indeed in the whole of Russia’s North, today’s crisis has to be seen in the context of that total crisis which destroyed the people’s livelihood in the 1980s. “We thought that it would recover, but it kept on falling throughout the 1990s and here we are still waiting for things to pick up again,” said Radik, as we drove by countless hectares of young pine trees growing in previously cultivated fields. “You say that the crisis is bad: look, the fields are being returned to nature.” I was not sure that the locals share his optimism. 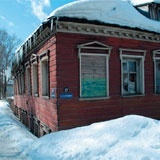 On arriving in Kargopol, I was taken directly to my home-stay location, a charming cottage overlooking the Onega River. The housekeeper, Margarita Lyzachova was ready to welcome me with tea and buns. Walking around near Margarita’s house, I bumped into Mikhail, an Old Believer who advised me to come and live in Kargopol and “unload from all the rubbish that modern society presents,” such as in the Internet, which he described as being: “complete garbage and the devil’s work.” With this, and other thought-provoking statements that I shall remember as I spend half my normal working day on the net, I set off on a tour around Kargopol accompanied by Valery Sivtsov, a retired, English-speaking Kargopol secondary school headmaster. Valery explained that Kargopol’s modern story is one of isolation. The nearest railway station is at Nyandoma, and the nearest north-south federal highway is a few hundred kilometers away. Local Old Believer merchants protested against the progress of what they saw as the satanic railway, and the line was diverted away from their town. As a result, Nyandoma developed quickly, and Kargopol stagnated. Kargopol has an oldy-worldy feeling about it. The majority of the buildings are wood, still inhabited and are thus in fairly good condition. This is a town trapped in the past, a working museum. 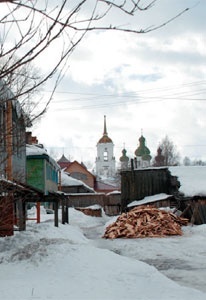 As normal for Russian nineteenth century towns, there is as yet no running water, sewage or mains gas supply in the majority of Kargopol homes. As we strolled around the center, studded with sixteenth and seventeenth century churches, each one of them steeped in history, Valery summarized the history of the town. “Kargopol was founded in 1146 by Novgorodian prince Richeslav who was sent to fight ‘strange local people with large eyes’ who attacked Novgorodian caravans on their way to the White Sea. Historians say that Slavs settled in the area in the 9th century. This makes Kargopol, which in Old Russian is derived from two words: Kargo meaning crows and pol meaning field, one of the earliest Russian towns.” A flock of crows passed overhead as if to endorse Valery’s words, and we both chuckled. “Ivan the Terrible gave Kargopol a monopoly for trading in salt from the White Sea,” Valery continued. “Merchants from Vologda, Yaroslavl and Novgorod came to Kargopol to trade. In 1585, the British ambassador to Russia Giles Fletcher listed the town as the 16th wealthiest in Russia. After Russian and foreign ships started using Arkhangelsk as a trading post, this wealth gradually declined. During the Soviet regime, Kargopol attained a different kind of celebrity: as a transit camp for tens of thousands of prisoners on their way to the many prison camps in the Arkhangelsk area. In 1939-40 there was a large camp in the town itself. Since then the town has benefi ted; like all of Russia, from increased federal budgets, however the town is too remote to attract cash spenders from St. Petersburg or other rich cities in the north and no new money has been invested here into industry. The only employment now, Valery lamented, is lumberjacking, where a man can earn 15,000 rubles a month. Even this though is under threat as the present crisis undermines demand for furniture and new wooden houses. The town has become, in Valery’s bitter humor: “a place for pioneers [a Soviet youth organization] and pensioners,” like many others in north Russia. The town has huge tourist potential, precious little of which has been realized. The town is very beautiful, if not rather sad. 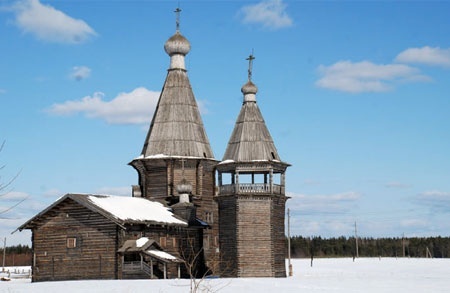 Now 11 stone churches and one bell tower adorn Kargopol, down from 26 churches in the town’s 16th and 17th century heyday. The churches are decorated with localized Kargopol stone work. Later that day I was whisked off by Radik to visit a private museum/clay dolls pottery workshop run by the Shevelev brothers, who are both skilled potters and artists. Their small museum; really a private house was cold, and I was about to think of an excuse to leave when I looked at the finished products. There were a few traditional Russian dolls of the highly-colored horsesdrawn sleigh variety, but the majority were pagan. Naked women ‘Bereginya’ (protector) with protruding breasts, and the pagan image of the sun on their navels. Here were various people with animal heads, horses, odd looking samovars with what looked like bears’ or wolves’ heads erupting from the sides. I asked why they were so keen on animals. Valentin Shevelev replied that he didn’t really know; this was just what they have always done. I asked if this was to do with Russia’s pagan past, again a blank look and no clear reply. The next day, Radik picked me up early, but not before Margarita Lyzachova had managed to serve me a delicious breakfast of porridge and pancakes. We travelled north to take in a collection of picturesque villages, each unique in its own way. Some of the churches and main buildings in each village had been partially restored, most had not. It is of course deeply disturbing that so many of Russia’s treasures lie in a state of abandoned ruin. 300 yearold wooden churches lie guarded by one rusting lock, if anything. There is nothing left to steal inside most of them. At least the visitor, like me, feels a connection with the past. Here the majority of bridges, one of which is 117 meters long, are still constructed out of wood, not because they have been restored, but because nobody has restored them. Here you enter history where the past is still the present. Radik showed me around various pagan sites between the villages we visited. One such site was at the entrance to a large wooded area, where three wooden crosses were placed, bedecked with garments. “This is typical symbiosis of Christianity and paganism,” Radik explained. “When people used to enter the forest in pre-Christian times, they used to offer a piece of clothing, such as a handkerchief and asked for happiness and health.” People still consider that it is good for one’s health to make off erings here, on the site of an old pagan ‘kapelshi’. Offering a piece of clothing from that part of your body which is ill, was apparently particularly popular during Soviet times. Now there are Russian Orthodox church crosses on this site, and images of Christ and the Virgin Mary adorned to them, which completes the symbiosis. On my last day in Kargopolye I visited the Kenozerskii National Park. This is a mere 139,663 square hectare area of protected pristine forest lakes set in idyllic hills, in many ways similar to parts of Finland. New dwellings cannot be built here by “outsiders” and locals can only build with special permission from the park authorities. What the park authorities build (the journalist in me found out) is, judging by various small hotels and businesses located in prime locations throughout the park, up to them. I was treated to a hair-raising cross-country trek by bobsleigh to an incredibly beautiful small wooden church – the church of Alexander Svirskiy, built in 1854; on the highest point in the southern part of the park. Of course the church was built on the spot of an old pagan worship site. One of the best parts of an organized tour like this was the opportunity to meet locals. It would have been difficult for me, not being an extrovert to have been able to have the conversations I had, and do and see what I managed to do in the space of a few days. 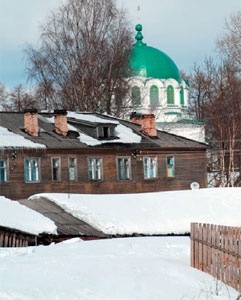 I recommend the Russian North to anybody wanting to discover a bit of the “real” Russia, if you are prepared for a few surprises.